Science tells us that the interactions between genes and environment shape human development. Despite the misconception that genes are “set in stone,” research shows that early experiences can determine how genes are turned on and off — and even whether some are expressed at all. The healthy development of all organs, including the brain, depends on how much and when certain genes are activated to do certain tasks. The experiences that children have early in life, therefore, play a crucial role in the development of brain architecture. Ensuring that children have appropriate, growth-promoting early experiences is an investment in their ability to become healthy, productive members of society. Inside the nucleus of each cell in our bodies, we have chromosomes, which contain the code for characteristics that pass to the next generation. Within these chromosomes, specific segments of genetic code, known as genes, make up long, double-helix strands of DNA. Experiences leave a chemical “signature” on genes that determines whether and how genes are expressed. Children inherit approximately 23,000 genes from their parents, but not every gene does what it was designed to do. Experiences leave a chemical “signature” on genes that determines whether and how the genes are expressed. Collectively, those signatures are called the epigenome. The brain is particularly responsive to experiences and environments during early development. External experiences spark signals between neurons, which respond by producing proteins. These gene regulatory proteins head to the nucleus of the neural cell, where they either attract or repel enzymes that can attach them to the genes. Positive experiences, such as exposure to rich learning opportunities, and negative influences, such as malnutrition or environmental toxins, can change the chemistry that encodes genes in brain cells — a change that can be temporary or permanent. This process is called epigenetic modification. Infographic: What is Epigenetics? And How Does it Relate to Child Development? This infographic shows how a child’s environment can change the chemistry of their genes—both negatively and positively. Epigenetic “markers” control where and how much protein is made by a gene, effectively turning the gene “on” or “off.” Such epigenetic modification typically occurs in cells that comprise organ systems, thereby influencing how these structures develop and function. Therefore, experiences that change the epigenome early in life, when the specialized cells of organs such as the brain, heart, or kidneys are first developing, can have a powerful impact on physical and mental health for a lifetime. The fact that genes are vulnerable to modification in response to toxic stress, nutritional problems, and other negative influences underscores the importance of providing supportive and nurturing experiences for young children in the earliest years, when brain development is most rapid. From a policy perspective, it is in society’s interest to strengthen the foundations of healthy brain architecture in all young children to maximize the return on future investments in education, health, and workforce development. 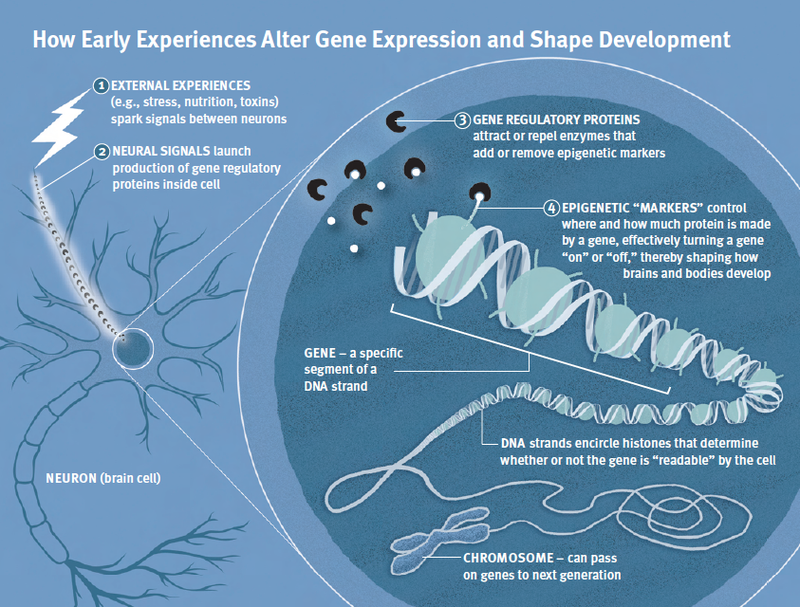 For more information: Early Experiences Can Alter Gene Expression and Affect Long-Term Development: Working Paper No. 10.